My former girlfriend, the late Anne Dinger, was a superb cook. I used to embarrass her by calling her the best cook I’d ever eaten. She gave me one piece of bad cooking advice, though, which led to my discovery of Lodge Logic. Anne was fond of cast iron cookware, for good reasons. So am I, now that I’ve had the experience. Anne taught me to use a cast iron skillet, and she told me that it had to be protected from rust. But her preferred method of drying her skillet was wiping it down and then putting it on the stove on high heat until any remaining water had evaporated. One sad day, about a year ago, I used this method, as I had for years. But then I left the house on an errand and forgot to turn off the heat. By the time I got back, the skillet had oxidized beyond repair. I’m lucky I didn’t burn the house down. I’ve seen old cast iron cookware at yard sales and flea markets many times, but usually at high prices and often in rather rusty condition. Just for the hell of it, I decided to try my usual last resort for specialty items and checked out Amazon. 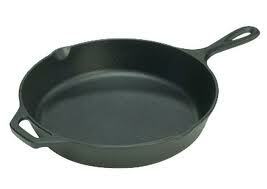 Sure enough, they had a 12″ cast iron skillet made by a company called Lodge Logic, offered at only $20.97. Because I’m an Amazon Prime subscriber, I didn’t even have to pay for shipping. That’s a good thing because, when the thing arrived, it weighed eight pounds! It was thicker and heavier than the old one I had ruined. And, to my surprise, it wasn’t made in China. It was made in the U.S.! I’ve now been using this skillet for about six months. There’s one thing about it I don’t love. It’s heavy! My right shoulder isn’t 100%, so sometimes I have to pick the thing up left-handed. And when it’s very hot, even with two hot pads it’s difficult to manipulate. If I want to pour some liquid out of it, I have a really hard time. This weight, though, is part of the skillet’s quality, so I really can’t complain about it. In every other respect, though, it’s a dream to use. Its surface is mottled, rather than smooth like my old skillet, which results in much less sticking to it. Anything that does stick is easily scrubbed off. It cooks very, very well, thoroughly and quickly. I’ve become rather fond of a brand of frozen fish burgers (Seafood Doctor swai burgers) and another of turkey burgers (Bubba), and I make them rather often for dinner. They cook more thoroughly on the Lodge skillet than they did on my antique, and in a bit less time. Anne to the contrary, Lodge’s instructions say that the pan should be cleaned without soap, using a stiff brush (I use a copper scrubber), then dried and re-oiled. 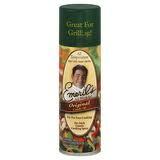 Emeril’s cooking oil spray works great, although–regrettable waste–I rub it down with a paper towel. Just one. I was so curious about this company that I looked it up. Lodge Cast Iron is located in the small town of South Pittsburg, Tennessee, where it has been making cookware since 1896. Although the company imports enamel coated cast iron cookware from China, it makes everything else at its factory in South Pittsburg. The company even boasts about, and details, its ecological responsibility. Recently, while visiting my house on Cape Cod, I discovered that a small non-stick frying pan had been worn bald by summer tenants. I decided to replace it with an iron pan. I went to the Cape Cod Flea Market in Wellfleet and found someone who sold antique iron cookware, and I bought a small pan from him although it needed some rehabilitation. Later the same day I was at my favorite local hardware store, Conwell Hardware in Provincetown, and I found the same size brand new Lodge pan, at the same price I’d paid for the antique. Someday I’ll do the work the old pan needs, but for that moment I thought wotthehell and I bought the Lodge pan. It’s probably better.